Hundreds of thousands of Palestinians across the West Bank and blockaded Gaza Strip on Friday crowded in cafes and open-air venues to watch the final episode of the popular Arab Idol reality show. Palestinians are hoping their 23-year-old contender from the Gaza Strip Muhammad Assaf will be declared the winner of this year’s series, which would be the first time for a Palestinian. Though the Palestinians in the occupied territories have tended to support Egypt and its singers, actors and soap-operas, now they seem ready for a Palestinian victory — if only on stage. One remark from Egyptian member of the jury Hassan al-Shafii gave them more hope than usual. He told the audience that a voice like Assaf’s comes around only once every 500 years. But if Assaf is to rely on only the Palestinian people voting for him, his chances are slim because the two other finalists, Muhammad Jamal from Egypt and Farrah Yousif from Syria, have a much bigger pool of voters compared to the relatively small population of Palestine. 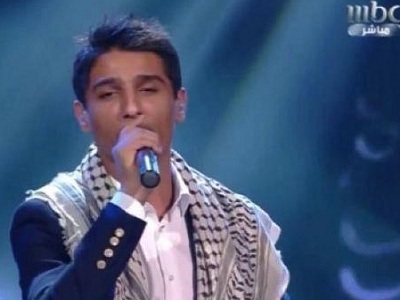 However, early indications show that large numbers of young people across the Arab world are voting for Assaf based on his singing abilities rather than nationality. “The experience of Muhammad Assaf is great and hopeful. It proves the Palestinian struggle is not restricted to certain lines, but is rather open to all fields including arts,” says popular Palestinian singer Ammar Hassan. Hassan gained popularity in Palestine and the Arab world through his participation in a similar show broadcast on the Lebanese satellite TV Future. He was one of the three finalists, though he didn’t win the title which went to a Libyan competitor. Assaf performed three songs Friday the last of which was a popular Palestinian song Alli al-Kufya, or “Wave High the Kufiya.” The Kufiya is a traditional Arab men’s headdress, associated abroad with the late Palestinian leader Yasser Arafat.